The treadmill is a home-gym staple, serving as a single piece of workout equipment and remaining one of the most popular choices in the industry. Choosing to purchase one is an excellent idea whether you want to start a fitness routine or stay in shape. However, it isn’t always so easy to pick out the right model for you. What Is The NordicTrack Commercial 1650 and How Does It Work? What Makes The NordicTrack Commercial 1650 Unique? Not all treadmills are created equal, which is why it helps to read reviews before making a final purchasing decision. How else would you know if a piece of workout equipment is worth the price? When it comes to the NordicTrack Commercial 1650, here’s everything you need to know from the features to the pros and cons. The NordicTrack Commercial 1650, often called the NordicTrack C, is a treadmill the company released in 2014. Feature-rich and recently upgraded with a 10-inch screen, there’s a lot to love about this folding treadmill. While there are newer, higher-quality models available from both NordicTrack and other companies, the C 1650 remains a top model in its class. Not only that, but the price tag is reasonable for most buyers in the market. Walkers and runners alike can enjoy the space-saving nature of this device along with its cushiony features from interactive Google Maps to the ability to surf the web. When comparing equipment models, it helps to know what individual features each one offers. This can help you determine if it is worth the price as well as which aspects would benefit your fitness goals. Here’s what we found out about this NordicTrack model. The NordicTrack Commercial 1650 comes loaded with a variety of consumer-friendly features. First, it features the ever-popular incline that consumers love. By adding an incline to a treadmill, you can push yourself to new heights and make the most out of every workout. Slopes are excellent for muscle toning and cardiovascular challenges. Next is the iFit Coach feature, which NordicTrack is known for. With a Wi-Fi connection and a monthly membership, you can access online races, personalized workouts, and even recipe suggestions to help you reach your fitness goals. Message boards help you connect with other iFit users, and the coaching aspect works like a real fitness trainer who can plan workouts, meals, and tell you when to go to bed. Aside from the pay-to-play iFit model, you can take advantage of the C 1650’s built-in programs. The touchscreen comes with 34 applications in four categories. You can choose from incline, speed, heart rate, and intensity. The 10-inch touchscreen also allows you to access the internet via an Android browser. So, you can surf the web while you walk or watch YouTube videos to gain access to even more workouts. Alternatively, you can choose to do the same with a tablet thanks to eye-level tablet holder. That holder is fully-adjustable, too. Like many models created after 2010, the NordicTrack Commercial 1650 also includes tow heart rate monitors in the handlebars and is capable of pairing with Bluetooth enabled wireless heart rate transmitters. This and other vital information are displayed on the touchscreen. Two three-inch speakers allow you to enjoy your music (which are an inch larger than previous models), an AutoBreeze fan self-adjusts to keep you cool, and the FlexSelect deck enables you to adjust cushioning to increase or decrease impact. The C 1650 folds up for simple storage as well. Finally, the warranty on a treadmill always adds to the uniqueness. NordicTrack offers an excellent one with this model, featuring lifetime protection on the motor and frame. There is a two-year warranty for labor and a full five-years coverage on parts and electronics. All NordicTrack treadmills come with a 30-day money back guarantee, too. One of the largest buying factors for workout equipment is the price. While most people want the convenience of a treadmill or other type of product in their home, some devices are simply too expensive to even think about. So, how much does the C 1650 cost? Pricing for this model varies wildly. 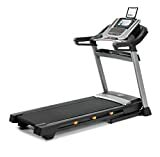 The condition of used treadmills plays a significant factor in this, though you can still find brand new models being produced by NordicTrack. While a used model might save some money, you’ll have to weigh the pros and cons of what shape it is in. The MSRP of this model is $2,000, but that price has come down over the years. Today, you can find the NordicTrack C 1650 for $1,400 from both NordicTrack’s website and other retailers. If someone is charging any more than that, don’t buy it. Used and refurbished models range from $600 to $800 depending on their condition and the seller. While the savings are substantial, it isn’t always easy to tell how much wear and tear the treadmill has. Rollers and other moving parts break down over time, so you might be better off purchasing a new model in the long run as opposed to paying out of pocket for repairs in a few months. Refurbished models don’t have the same issue. They are already fixed up and ready to go upon purchasing. If you want to save money on the cost, this could be your best bet without having to worry about repairs. Often, refurbished models come with their own warranties. So, make sure to read up on all the necessary information before buying one. Membership to iFit Coach is something to consider when looking at the price as well. Your first year is included free with your purchase, a $144 savings. After that, you can choose to opt out or continue your membership for $12 each month. This is another excellent reason to purchase new instead of used. What better way to learn more about whether you would like a product than through customer reviews? Users’ experiences and blogs contain excellent information on how this treadmill performs, where it succeeds, and where it falls short of the mark. Public perception for the NordicTrack Commercial 1650 is immensely positive. Review sites gave it numerous four to four and a half star reviews, while others gave it a percentage score of above ninety. Positive ratings came from this treadmill’s extensive list of programs and technological support from both its online capabilities and iFit Coach. Others noted the 3.5 CHP motor performs above and beyond more advanced models released in later years. As for the price, nearly everyone agreed this was a steal based on its numerous features and excellent warranty. Negative comments mentioned that, while the treadmill’s ability to fold up helps save space, it’s footprint while in use is incredibly large. Others said the assembly is difficult and that customer service isn’t always as helpful as they should be when something goes wrong. Finally, most mentioned that the 1.9-inch rollers were small for a Commercial Series treadmill, which leads to problems down the road. Wear and tear on a treadmill’s rollers is the number one cause for issues with these machines. Larger rollers tend to last longer thanks to their ability to support more weight without undue pressure. At 1.9 inches, the rollers will last. They will not last as long as the 2.5+ inch rollers that usually come with Commercial Series models, though. While it isn’t perfect, the NordicTrack Commercial 1650 does provide a satisfying workout. The main complaint online was damage from improper assembly, followed by shabby customer service or a long wait for new parts. The top positive remarks include its powerful motor and tech features. 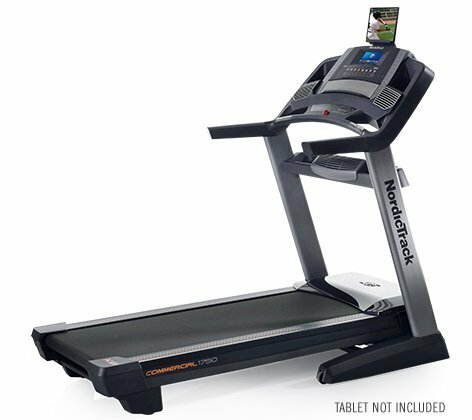 When looking at other treadmills, NordicTrack leads this industry with a variety of models. The 1650’s most formidable contender is the next model up, the 1750. At only $200 more, it's worth comparing the two. First, the 1750 offers a 15% incline instead of 12%. It also provides a 3% decline, a nonexistent feature on the 1650. Both models include one year of iFit Coach, but it might come as a surprise that the 1750’s touchscreen is only seven inches as opposed to the 1650’s ten-inch screen. Then 1750 features improved speakers, a longer belt, and a slightly more powerful motor (by 0.1 CHP). Its rollers are also larger at 2.5-inches, prolonging the machine’s lifespan. Other than those differences and a more modern look, the 1750 and 1650 models are mostly the same. The Sole Fitness F80 Folding Treadmill is one of NordicTrack’s competitor models. It features the increased 15% incline, the same deck size as the 1750, and the ability to create two custom workouts. However, the majority of stats remain precisely the same. Sole Fitness’ F80 has a smaller screen than the 1650 that is not web-enabled, a lower-grade fan, and its only connectivity features are a sound system and wireless chest strap. However, that chest strap is included with your purchase. It also costs around $1,400. All in all, the 1650 offers far more features for the same price. While it beats out the F80 from Sole Fitness, it is slightly outdone by the 1750. That makes sense, but you’ll have to decide if the extra $200 is worth the price for the next-level model. Is the C 1650 the best treadmill on the market? If not, is it worth the price for anyone looking to add this type of workout device to their home? After extensive research on this product, here’s what we think. Our verdict on the NordicTrack Commercial 1650 is: This is an excellent treadmill for the price. Compared to similar models in its class, it holds its own on every level. For an affordable price, you can enjoy a multitude of amenities on your workout device that help you reach your fitness goals while providing comfort. The motor is powerful, the build is solid, and the warranty is fantastic. With a year’s membership to iFit Coach included, you can achieve the results you’re looking for as long as you put the time into your exercise routine. We love the numerous features and thoughtful little add-ons, like the fan that speeds up when you’re pushing yourself harder. There’s plenty of incline at 12%, too. While there is no decline, this isn’t a problem for most consumers looking to incorporate a treadmill workout into their week. Finally, the connectivity options exceed most 2014 models. Out of five stars, we’re giving the NordicTrack Commercial 1650 a four and a half rating. While new, high-end models offer a lot more, this treadmill delivers top-quality features at a now mid-level price. Looking to save a little extra cash? That’s a rhetorical question, of course. Who doesn’t like saving money? We found two sure-fire ways to help you bring the cost of your new C 1650 down. Discounts are everywhere for the C 1650. Retail Me Not, and similar discount websites have offers of up to $75 off the retail price for a new model. Others offer 60% off and other excellent deals that are hard to pass up. Just make sure that the website providing you coupons is secure and legit before clicking on anything. NordicTrack also offers website sales from time to time. You can often find decreased prices online dropping costs down by $1,000 or more on select pieces of equipment. They also offer 0% APR deals for a certain period after purchase. Either deal makes their treadmills and more affordable.